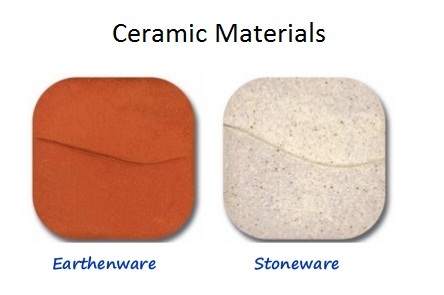 Distinguish, differentiate, compare and explain what is the difference between Earthenware and Stoneware Ceramics. Comparison and Differences. Ceramics are defined as any non-metallic, inorganic material that is formed by the action of heat. Clay is the longest known and most common of the ceramics. Clays, based mostly upon their ability to vitrify (become hard) but also to some extent on plasticity and porosity, can be divided into three general groups: earthenware, stoneware, and porcelain-type clay. The biggest difference between stoneware and earthenware is porosity. That’s the density of the particles. Earthenware matures at a much lower temperature than stoneware when fired. In fact, because earthenware is so much more porous, the surface must have an applied glazed to cut down on liquid absorption. On the other hand, stoneware is so dense that glaze is not necessary to keep it from absorbing liquids. Stoneware is fired at very high temperatures so that it becomes on-porous, almost like glass. The heat literally melts down the microscopic holes until it’s impervious. Earthenware is fired at lower temperatures and is porous. It can also be easily scratched and damaged, whereas stoneware resists scratches very, very well. Earthenware is a clay fired at low temperatures where it does not become vitreous. It is porous and therefore not as strong as stoneware and porcelain. Glazes are usually very bright colored and if the glazes are properly chosen, earthenware can be quite strong and functional. Earthenware glazes will never be as hard as a porcelain or stoneware glaze surface. Therefore an earthenware glazed pot or plate will scratch or chip more easily than the harder surface of porcelain or stoneware. Terracotta refers to a type of earthenware that contains red burning clay. Majolica is terracotta with an opaque white glaze, usually decorated with a colored over-glaze, and is stronger than terracotta. Earthenware is usually best for conventional and microwave oven use. However, some can also be used on top of the stove. If glazed, it becomes non-porous and can also be used to cook liquids and store foods. Washing by hand is generally recommended. Stonewares are high fired ceramics (usually containing fireclay, which adds to their strength). They are often made of clays that are not highly refined. They can be brown, buff or white, and commonly have some specks and some particulate material such as sand or fine grog. Stonewares are vitreous or semi-vitreous, not translucent. They can be used in conventional and microwave ovens. Some stoneware can also be used over an open flame. Glazed stoneware is non-porous and can also be used to store foods. Some stoneware is dishwasher safe; we recommend washing by hand.